A meal of "bread and water" sounds like a harsh sentence. Change that to "bread and beer" at Ardmore's Tired Hands - their crusty loaves baked in cast-iron pans with ale yeast - and I'll have fun all night. Jean Brouillet IV's formula for a brewery-cafe is simple, where the local fare is in service of his inventive beers. And that sturdy bread, served with a rich yellow Trickling Springs butter, sea salt, and fennel pollen, is all the sustenance I'd need. 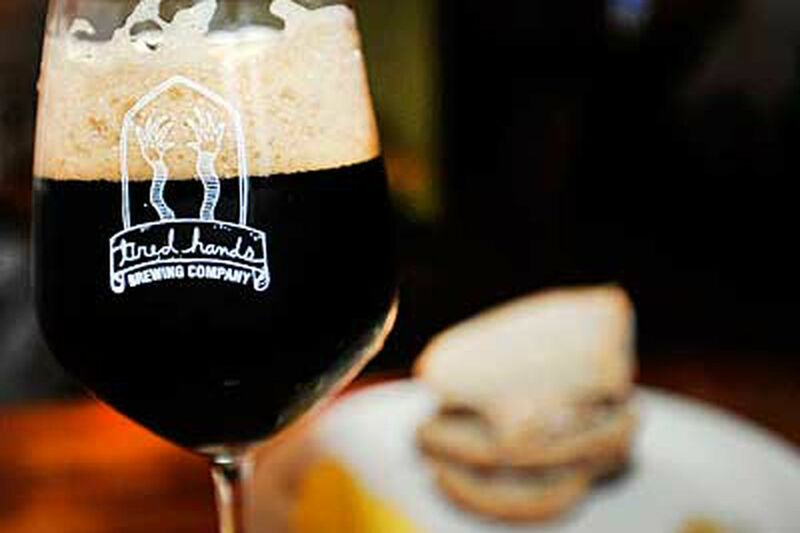 As one of the brightest entries in our current micro-brewery boom, Tired Hands beers are worth the spotlight, with numerous interesting variations on hoppy American ales and Belgian-style saisons, my favorites, anchored by funky and bubbly FarmHands. But I've been especially tickled by Brouillet's experiments, like his ultimate Gallic twist on oyster stout: Artisnale, a chocolaty, licorice-tasting black brew steeped with 25 calcium-rich pounds of empty escargot shells from nearby Teresa's Next Door. It may be the ultimate Slow Food brew, but good luck pacing yourself, slice-by-sip-by-slice.